Kaesong (Gaeseong; ) is a city in North Hwanghae Province, southern North Korea (DPRK), a former Directly-Governed City, and the capital of Korea during the Koryo dynasty. The city is near the Kaesong Industrial Region close to the border with South Korea and contains the remains of the Manwoldae palace. Called Songdo while it was the ancient capital of Koryo, the city prospered as a trade center that produced Korean ginseng. Kaesong now functions as the DPRKs light industry centre. It was also known as "Keson" during Japanese rule between 1910 and 1945. Due to the citys proximity to the border with South Korea, Kaesong hosts cross-border economic exchanges between the two countries as well as the jointly-run Kaesong Industrial Region. As of 2009 the city had a population of 192,578. The earliest archaeological signs of habitation in the Kaesong area date from the Neolithic Age. Artifacts such as Jeulmun pottery, stone ware, and stone axes have been excavated from Mount Osong and Kaesong Nasong (the double-walled fortress of Kaesong). 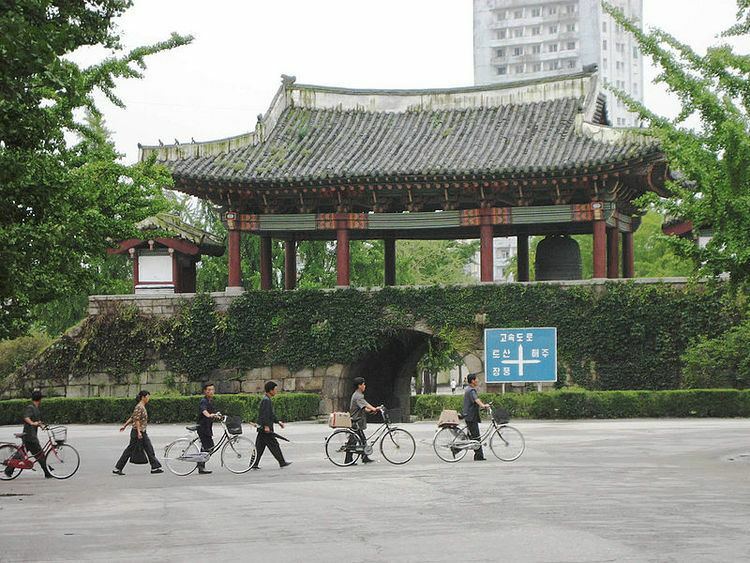 As Kaesong has been occupied by various states throughout centuries, its name has changed. It was in the realm of Mahan confederacy, and was referred to as Busogap during the rule of Goguryeo. Before the strength of Baekje was retreated to the southwest of Jungnyeong, Joryeong, and Asan Bay in 475, the area had been a part of Baekje for about 100 years. However, it became a territory of Silla since 555, the 16th year of King Jinheung and its name was changed to Songak-gun during the period. According to Samguk Sagi, when a castle was built in the site in 694, the third year of King Hyosos reign, Kaesong was referred to as "Songak (?? ; ??)". Therefore, it is assumed that the name Songak had been used at least before the time. Silla began to decline in late 9th century, and a period of rival warlords ensued. In 898, Kaesong fell under the hand of Gung Ye, the founder of his short-lived state, Later Goguryeo, and then became a part of Goryeo in 919 by its founder, Wang Geon. Wang Geon established the capital in the south of Songak, and incorporated Kaesong County into Songak under the name of "Gaeju". In 919, Kaesong became the national capital. In 960, the 11th year of King Gwangjongs reign, the city was renamed Gaegyeong, and in 995, the 14th year of King Seongjongs reign, it was elevated to "Gaesong-bu". The Gaeseong-bu is a combined term of Songak-gun, and Gaesong-gun, which is different from the region of the pre-1945 Gaesong-ri, Seo-myeon, Kaepung-gun. In 1010, the first year of King Hyeonjongs reign, the palace and houses were almost burnt down during the Second Goryeo–Khitan War, so in 1018, Gaesong-bu was relegated for the "bu" system, and became to govern the three hyeon unites of Jeongju, Deoksu, and Gangeum. In the late 12th century, there was instability in both the government and the countryside. A slave named Manj?k (or spelled as Manjeok) (?? ; ??) led a group of slaves who gathered outside Kaesong in 1198. The revolt plot was suppressed by Choe Chung-heon. When Yi Songgye overthrew the Koryo Dynasty in 1392 and established the Joseon Dynasty, he moved the Korean capital from Kaes?ng to Hanyang (modern-day Seoul) in 1394. Kaes?ng remained a part of Gyonggi Province until the Korean War. When Korea was partitioned at the 38th parallel after World War Two, Kaesong was on the southern side of the line (within the Republic of Korea). Kaesong was captured by the Korean Peoples Army (KPA) in the first days of the Korean War. The city was recaptured by UN Forces on 9 October 1950 during the pursuit of the KPA that followed the successful Inchon landings. UN Forces abandoned the city in mid-December 1950, during the withdrawal to the Imjin River following the Chinese Peoples Volunteer Army intervention in the war and Kaesong would remain under Chinese/North Korean control until the end of the war. Ceasefire negotiations began in Kaesong on 10 July 1951, but were moved to Panmunjom on 25 October 1951. The Korean Armistice Agreement signed on 27 July 1953 recognised North Korean control over Kaesong making it the only city to change control from South Korea to North Korea as a result of the war. Postwar Kaesong and the part of Kyonggi Province that came to be occupied was organized into "Kaes?ng Region" (Kaes?ng Chigu; ?? ?? ; ?? ??). In 1955, Kaes?ng became a "Directly Governed City" (Kaes?ng Chikhalsi; ?? ??? ; ?? ???). In 2002, Kaes?ng Industrial Region was formed from part of Kaes?ng. In 2003, the remaining part of Kaes?ng (excluding the Industrial Region) became part of North Hwanghae Province. 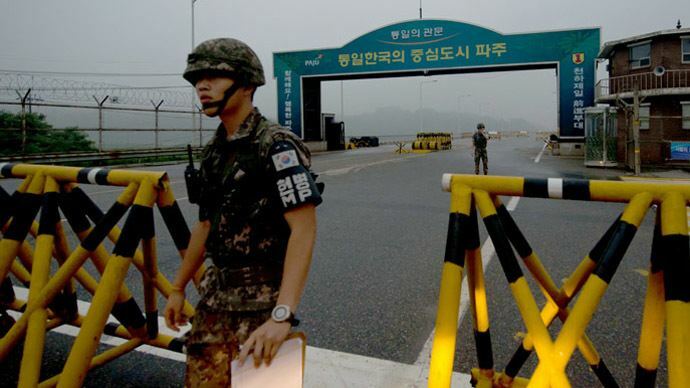 The city is close to the Demilitarized Zone that divides North and South Korea. 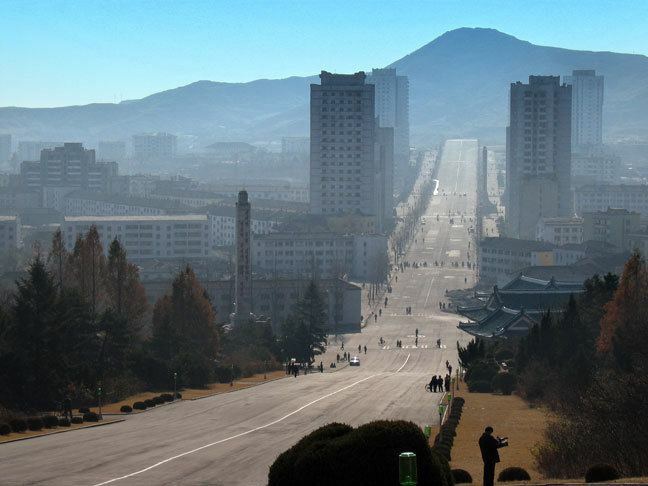 Located in the center of Korea, Kaesong is the southernmost city of North Korea. It is bordered by Kaepung, Changpung, Panmun, and Kumchon counties. Kanghwa Island of Incheon Municipality lies just south, beyond a narrow channel. It covers an area of 1,309 km², the urban district is surrounded by Songak (Songak-san; ??? ; ???) (489 m) and Pongmyong mountains. The city center surrounds the much smaller Mt. Janam (103 m), on which is located the citys iconic Kim Il Sung statue. In the northern part of Kaesong, the end of the Ahobiry?ng range creates the northernmost border of Kaesong City. This range consists of Mts. Ch?nma (757 m), S?ngg?, Myoji (764 m), Suryong (716 m), Ches?k (749 m), Hwajang (558 m), and Ogwan. With the exception of the mountainous northeastern region, however, most areas of Kaesong consist of low hills with the height less than 100 meters. The Imjin River flows along the northeastern border line of the city and the Ryesong River (???) (Ryeseong-gang; ???) (spelled in South Korea as Yeseong-gang; ???) runs along the western border to the mouth of the Han River. In addition to the two rivers, small and large rivers and streams such as Samich?n, W?lamch?n, Chukbaech?n, K?ms?ngch?n, and Sach?n rivers drain into the Han. The river basin located in the southwest of Kaesong has spacious alluvial plains such as Pungd?kb?l, Singwangb?l, and Sams?ngb?l. The geology consists of the Proterozoic, Cenozoic, and Paleozoic strata and Mesozoic intrusive granite. The underground resources include gold, zinc, copper, fluorspar, limestone, granite, and kaolin. The soil comprises generally brown forest soil while the areas drained by Yes?ng, Imjin, and Han rivers consist of mostly alluvial and saline soil. The climate is generally warm and moderate, with an average annual temperature of around 10 ?. The coldest month is January, with an average temperature of -5.9 ?, while the hottest month is August, with an average temperature of 24.7 ?. The average annual rainfall ranges from 1,300 to 1,400 millimeters. The duration of frost-free period is 180 days — the longest in North Korea. About 55% of Kaesong is forested (80% of the trees are pines), and 40 species of mammals and 250 birds inhabit the area. Koryo Songgyungwan University (Light Industry), Communist University and Art College are located in Kaes?ng. The Koryo Museum, housed in the citys old Confucian academy, contains many priceless Koryo arts and cultural relics (although many are copies, with the originals held in the vaults of the Korean Central History Museum in Pyongyang. As the former capital of the Koryo dynasty, the tombs of almost all of the Koryo kings are located in the area, though most are not accessible; the heavily reconstructed Hyollung Royal Tomb, belonging to the dynastys founder, Taejo, is located to the west of the city in Kaepung-gun. Other notable tombs include those of kings Hyejong (the Sollung Royal Tomb), Kyongjong (Yongrung), Songjong (Kangrung), Hyonjong (Sollung), Munjong (Kyongrung), and Kongmin (Hyonjongrung). Kaesong also contains north Koreas only two royal tombs dating to the Joseon dynasty; the Hurung Royal Tomb, belonging to the dynastys second king, Jongjong, and the Cherung Royal Tomb, containing the remains of Queen Sinui, wife of the dynastys founder, Yi Songgye. The two final tombs, despite belonging to members of the Joseon royal family, were excluded from the World Heritage listed "Royal Tombs of the Joseon Dynasty because of their location in North Korea. 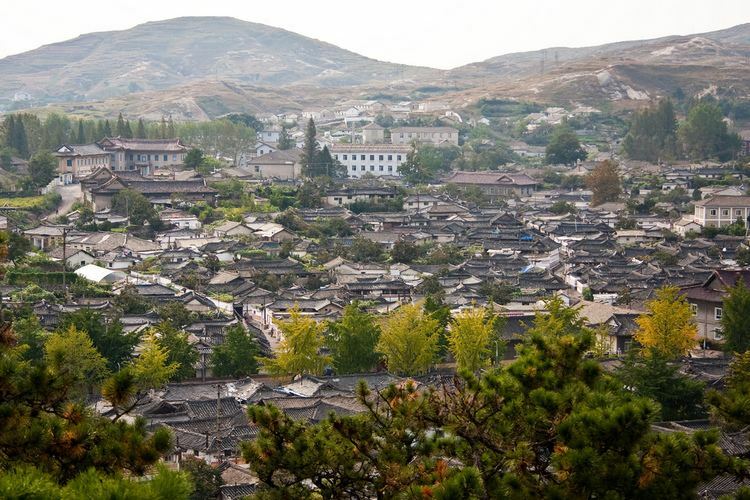 With its topography, climate and soil, Kaesong has advantageous natural conditions for agricultural productions. The water supply system is established with 18 reservoirs, including Songdo Reservoir, built for agricultural advances and about 150 pumping stations as well as hundreds of dammed pools. The cultivated land accounts for 27 % of Kaesongs area. Rice, maize, soybeans, wheat, and barley are the main crops. Among them, rice production accounts for 60 % of the whole grain production, and Kaepung and Panmun are the two primary regions, producing more than 70 % of the rice production. In addition, vegetable and fruit cultivation including peach, apple and persimmon, livestock farming, and sericulture are active. Peach is a local specialty of Kaesong, especially white peach, which accounts for more than 25 % of the total fruit production. The counties of Kaepung-gun and Panmun-gun are also known for cultivating the quality Korean ginseng called Goryeo Insam. As Kaesong was the capital of Goryeo with almost 500 years of rule, its culinary culture was highly developed. The luxurious style of Kaesong cuisine is frequently compared with those of Seoul cuisine and Jeolla cuisine. Kaesong cuisine was traditionally treated as part of Gyeonggi cuisine, since Kaesong belonged to Gyeonggi province until 1950. However, it has been incorporated into the administration of North Korea after the Korean War while Gyeonggi province is administered by South Korea. Bossam kimchi (wrapped kimchi), pyeonsu (summer mandu in square shape), sinseollo (royal casserole), seolleongtang (beef tripe soup), chueotang (mudfish soup), joraengi tteokguk (rice cake soup), umegi (tteok covered with syrup), and gyeongdan (ball-shaped tteok) are representative Kaesong dishes. Umegi, also called Kaesong juak is a holiday food of Kaesong, and known for the delicate style with the sweet and nutty taste. The dish is made by kneading a mixture of rice flour and glutinous rice flour with warm water, by shaping the dough into balls with either one pine nut or jujube, by frying and coating them with syrup.